Glen Campbell, Country Music Legend, Is Dead At 81 : The Two-Way Singer, guitarist and Country Music Hall of Famer Glen Campbell has died after a very public struggle with Alzheimer's disease. He was 81. American country & western singer Glen Campbell, who passed away Aug. 8, 2017, pictured in 1967. Singer, guitarist and Country Music Hall of Fame inductee Glen Campbell has died at age 81 in a Nashville care facility after a very public struggle with Alzheimer's disease. Campbell's death was announced in a statement from his family. Campbell was an iconic performer whose career spanned half a century, and who blurred the lines between country and pop. Campbell once said he didn't consider himself a "country singer," but rather a "country boy who sings." And historian John Rumble from the Country Music Hall of Fame says Campbell had something few do. "When he was on stage and started to sing, you knew there was a star on stage," Rumble says. "I don't know how to explain it. It's an aura. It's a feeling. You knew this was somebody special." 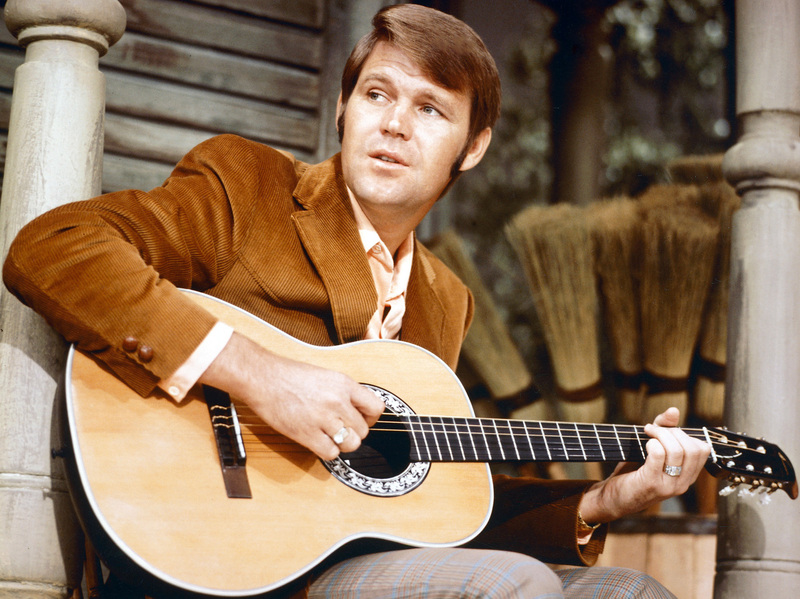 His biggest hit topped both the pop and country charts in 1975: "Rhinestone Cowboy." Long before he was a household name, Campbell was a studio musician in Los Angeles, part of the famous "Wrecking Crew," a loose cluster of studio players who backed stars on many hits of the day. Campbell was a self-taught guitarist whose training consisted mostly of informal lessons in the lap of his Uncle Boo back in Arkansas. Campbell couldn't read music, but Rumble says he could play anything. "Glen just fit right in, he was so doggone good," Rumble recalls. The exact scope of Campbell's output in the '50s and '60s is unknown, because producers cloaked who actually played on a session. But he provided guitar parts for records by Jan and Dean, The Monkees, Frank Sinatra and The Beach Boys. Campbell even became a Beach Boy for about six months, replacing front-man Brian Wilson on tour. Years later, Campbell mentioned it in his own concerts. "It was fun, but I didn't want to spend the rest of my musical career playing bass and singing the high part," he joked. His solo career got off to a slow start. But after a few minor hits, he found a groove. He began a long-term collaboration with songwriter Jimmy Webb, who says he grew up daydreaming about working with Glen Campbell. The two would become musical partners. And Webb says Campbell doesn't get enough credit for his contributions beyond performing. "Nobody compared with him when it came to picking a song and then arranging it," Webb said. "He left his stamp on whatever material he did." Together, Webb and Campbell produced such Top 40 hits as "By The Time I Get To Phoenix" and "Wichita Lineman." Campbell's chart success led to opportunities in film and TV, including a stint on network television, where he hosted Glen Campbell's Good Time Hour. Guests ranged from actor John Wayne to The Monkees to his own family. But at the height of his fame, Campbell hit personal lows — divorces and a drug and alcohol problem. His struggle with cocaine surprised those who knew him best, considering his Christian upbringing and outspoken faith. Eventually, though, he got his life back in order and continued performing. Then, in 2011, he announced he'd been diagnosed with Alzheimer's. And instead of receding into the shadows, he planned a tour. For more than a year, he played shows around the country, backed by a band that included some of his children. Campbell couldn't remember his kids' names and faces but he could still feel out a fretboard and astonish a crowd. Film maker James Keach directed a documentary, I'll Be Me, that chronicled the farewell tour. "It was completely embedded in this guy's psyche and he'd done it since he was five years old," Keach tells NPR. "It's his default is that his hands will start doing that. That's his language. His first language is music." Keach says Glen Campbell never warmed up, and never sang out of key. It was an unexpected blessing to Campbell's fans that his musical talent was one of the last things to go. Campbell is survived by his wife, Kim Campbell; three children from their marriage (Cal, Shannon and Ashley); his children from previous marriages (Debby, Kelli, Travis, Kane and Dillon); ten grandchildren; and a number of great- and great-great-grandchildren. NPR production assistant Benjamin Naddaff-Hafrey also contributed to this report.